NEW YORK Shares of J.C. Penney (JCP) fell 10.6 percent on Tuesday to a four-year low after media reports said a large shareholder sold a chunk of the struggling retailer's stock. The stock lost $1.78 to close at $14.96, its lowest price since March 2009. Vornado Realty Trust, once the company's second largest shareholder, sold almost half its stake, or 10 million shares, at $16.40 per share through Deutsche Bank (DB), according to a Bloomberg report on Tuesday that cited people familiar with the matter. That price would be a 2 percent discount to the stock's closing price of $16.74 on Monday. CNBC and The Wall Street Journal late Monday reported Deutsche Bank was shopping the shares around, also citing unnamed sources. Vornado did not return calls for comment. Deutsche Bank declined to comment. Again citing unnamed sources, the Journal said that some of Penney's board members, including activist investor William Ackman, may want to sell the company or replace CEO Ron Johnson, if a steep sales slide isn't halted. 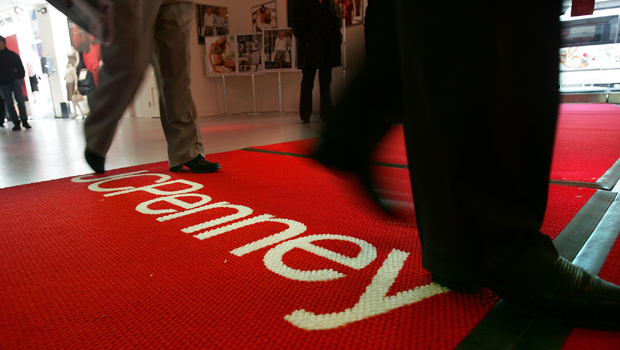 It's the latest in a string of bad news for J.C. Penney. The chain is in the middle of a legal battle with Macy's (M), which sued media and merchandising company Martha Stewart Living Omnimedia for breaching an exclusive contract when Martha Stewart signed a deal with Penney in December 2011 to open shops at most of its stores this spring. It's also reeling from drastic changes that Johnson has made to its business, including slashing the number of sales in favor of everyday low prices, bringing in hipper designer brands such as Betsy Johnson and remaking outdated stores. The company has reported big losses and sales declines for four straight quarters since it started the strategy. In its most recent quarter ended Feb. 2, the Plano, Texas retailer reported a much larger-than-expected loss as revenue plunged nearly 30 percent. Investors have sent shares of Penney down more than 61 percent from a peak of $43 in the days after the pricing plan was rolled out a year ago.